Institute of Health Technology & Medical Assistance Training School (IHT & MATS) Admission 2017-18 will start on August 2017 by Directorate General of Health Services Board. The students who want to apply on Diploma IHT or Diploma MATS 2017-2018, this article is very important for them. Because there is a complete advice for them and all the rules of admission are discussed in detail. There is a complete concept of Diploma IHT and MATS admission from one place, from which admission can be obtained from all the activities for admission. 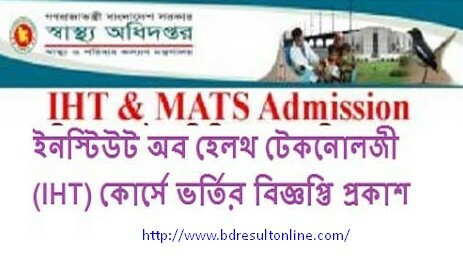 Here’s what you’ll know, IHT & MATS Admission Circular 2017-18, Exam Date, Application Process, Short Suggestion, Syllabus & Question pattern, and Admission result. The Students Who Passed SSC Exam to the lead GPA 2.50 or More Can Apply for the IHT (Institute of Health Technology) Admission Test 2017-18 Sessions. In order to give you admission test, you will need to collect the entry form the institution that you wish to enroll. Below is a list of the organizations that you can get the Admission Letter. Institute Of Health Technology, Mohakhali, Dhaka. Institute Of Health Technology, Chittagong. Institute Of Health Technology, Rajshahi. Institute Of Health Technology, Bogra. Institute Of Health Technology, Tazhat, Rangpur. The Students Who Passed SSC Exam to the lead GPA 2.50 or More Can Apply for the MATS (Medical Assistance Training School) Admission Test 2017-18 Sessions. You can get admission forms from the organizations that are listed below. The applicant must have passed the examination of 2017, 2015-2016. And any board student can apply. Applicants must pass pathology (Physic), biology and chemistry science separately. Applicants can easily apply through SMS. All the methods of how to apply through SMS are given below very simply. You can apply easily by following the steps below. First of all, the applicant has to send SMS via Teletalk SIM from his mobile phone. Take a look at how to send SMS from below. For the General Students: DGHS<Space>SSC Board<Space>SSC Roll<Space>SSC Passing Year<Space>Choice 1, Choice 2<Space>Division Code Number<Space>Quota Code & send to 16222. For the O Level Applicant: DGHS<Space>OLV<Space>ID Number<Space> Choice 1, Choice 2<Space>Division Code Number<Space>Quota Code & send to 16222. For the Departmental Applicant: DGHS<Space>DEP<Space>ID Number<Space> Choice 1, Choice 2<Space>Division Code Number<Space>Quota Code & send to 16222. After Successful sending the 1st SMS, You will receive a Confirmation SMS with an Applicants Personal Information and a PIN number. Keep Balance 600 TK in Teletalk Prepaid Mobile Account and then keep Ready to complete 2nd Step. Then Again go to the Mobile Message Option and type to this text: DGHS<Space>YES<Space>PIN Number<Space>Exam Centre (Table-1) <Space>Contact Number & send to 16222. Then you will receive a Confirmation SMS; When the Payment will be completed! Thanks To all. If you any question please write your problem in the comment box below. Next HSC result 2018 Dhaka education board.